Putin’s close friend and ally, the head of the Chechen Republic Ramzan Kadyrov, unwittingly exposed Russia’s longstanding strategy of labeling their opponents “fascists.” In an interview, Kadyrov said: “Our people were against the Russian Federation, because they were sending tanks against us and blessing them as though they were going to fight against fascists. We saw all of that and suffered through it. That’s what forced us to be against Russia.” Thus, Russia claimed there were fascists in Chechnya (to justify its wars and horrific atrocities in the region), Georgian fascists (to justify its occupation of South Ossetia and Abkhazia), Moldovan fascists (to justify its activities in Transnistria) and now, Ukrainian fascists (to justify its annexation of Crimea and covert invasion of Eastern Ukraine). When parallels were drawn between Russia’s annexation of Crimea and Hitler’s annexation of Sudetenland, Russian propagandists suggested that pre-1939 Hitler was “the good Hitler,” whose earlier actions should not be judged in the context of WWII. Likewise, when Russian propaganda was compared to that of Nazi Germany, Putin gushed that Goebbels was “a talented man” who achieved his objectives. Attendees of the St. Petersburg forum repeatedly called U.S. President Barack Obama “a Nazi,” referred to gays as perverts (using derogatory slurs) and callously suggested that murdered Putin opponents Boris Nemtsov, Anna Politkovskaya and Boris Berezovsky are now residing “in hell.” Nick Griffin, Holocaust denier, the expelled former leader of the anti-immigrant British National Party and a fervent defender of Neo-Nazis, said: “If you tried to have a conference like this in the U.S. or the U.K., it wouldn’t be allowed.” In fact, this kind of a hate-fest most likely wouldn’t be allowed in any civilized country. The forum ventured into the cartoonish ‘Far Side’ far-right. Amongst its attendees was a well-known St. Petersburg Nazi, Alexey Milchakov, who was named in the EU list of sanctioned individuals for his terrorist activities in Ukraine. Milchakov rose to infamy for murdering and eating a puppy on-camera. He later joined the so-called “separatist movement” in Ukraine and was filmed torturing Ukrainian POW’s. Milchakov said that he attended the forum to solicit the attention of the news media and financiers. Roberto Fiore, leader of Italy’s far-right party Forza Nuova, said: “I don’t find it defamatory to be called a fascist.” Fiore was tried and convicted in absentia for being a member of a fascist terror group, implicated in the Bologna bombing of 1980, which killed 85 people. Fiore said that Moscow is now the sole guardian of Western values, in the way Rome once was. “It’s not me saying this—it’s God saying it,” Fiore exclaimed. These statements echo Deputy PM Rogozin’s recent assertion that the Russian state “is directly governed by God.” Continuing the theme of Russia as a “third Rome” is the bust of Putin, draped in a Roman tunic and wearing a laurel wreath, which is soon to be unveiled in St. Petersburg. 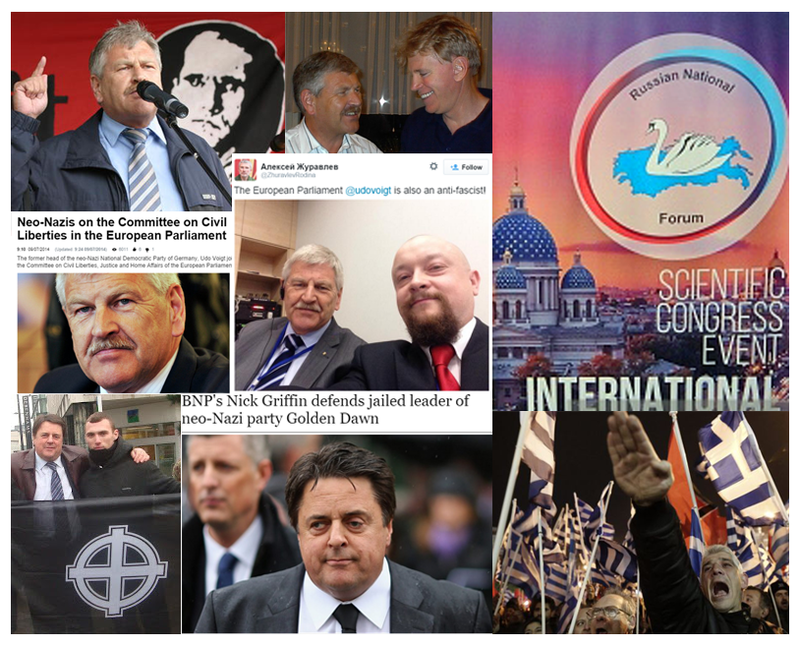 Udo Voigt, a senior figure in Germany’s extreme-right National Democratic Party, attended the forum as another figure in a rogues’ gallery of Neo-Nazis, fascists, Holocaust deniers, homophobes, misogynists, racists and white supremacists. Voigt is a fervent admirer of the Third Reich and the son of a Nazi soldier, whom he calls his “role model.” In 2004, Voigt was charged with incitement to hatred for calling Adolf Hitler a “great man.” In 2007, he faced additional charges for suggesting the name of Hitler’s deputy, Rudolf Hess, for the Nobel Peace Prize. In 2009, Voigt received a suspended prison sentence after being charged with inciting racial hatred and defamation for circulating racist pamphlets during the 2006 World Cup. Voigt handed out pamphlets that claimed that a black player was not worthy to play for Germany’s national team, which they said should be made up of whites only. In 2012, Voigt received a 10-month suspended sentence for glorifying the actions of Hitler’s SS. Russian PM Alexey Zhuravlev proudly posed for a selfie with Voigt, referring to him as another “antifascist.” Other forum attendees included former KKK lawyer Sam Dickson and Georgios Epitidios, a representative of Greece’s neo-fascist/ neo-Nazi Golden Dawn party. Cas Mudde, a political scientist who specializes in extremism at the University of Georgia, said: “You don’t need to go to the gutter to find some pro-Putin right-wing parties, but they did for some reason.” Jared Taylor, a U.S. author and proponent of what he calls “racial realism,” author of the book “White Identity,” said that even he was aghast at the attendance list, but attended the forum anyway, since the organizers paid for his plane ticket and hotel. “When you’re on the fringe, there’s no soapbox too low,” Taylor said. While openly frolicking with fascists, admirers of Hitler and Neo-Nazis didn’t present a problem for the organizers of the Russian forum, Putin’s propaganda machine attempted to paint Ukraine’s Prime Minister Arseniy Yatsenyuk as a Nazi, based on his facial features and falsely claimed that the image of Hitler would soon appear on Ukraine’s currency, hryvnia. At the same time, Russian mainstream media didn’t make much fuss over two men being attacked in Moscow because of their alleged “non-Slavic appearance.” One of the victims died in a hospital. Conscientious Russians protested the fascist forum, only to be arrested and brutalized by the police. Their slogans read, “We don’t need foreign Nazis – we barely know what to do with our own [Nazis] in St. Petersburg” and “No to Nazis.” One of the protesters ended up in a hospital with a head trauma. Suffocating dissent is something Putin fiercely supports. He openly admires the ideas of Russian Orthodox philosopher Ivan Ilyin, who said Russia should plot an independent course between dictatorship and democracy. Putin also admires Tsarist Prime Minister Pyotr Stolypin, who brutally crushed dissent. Russian President said that a statue should be erected in honor of Stolypin outside the Russian government’s headquarters in Moscow. Another one of Putin’s heroes, the founding father of modern Singapore Lee Kuan Yew, passed away today. He jailed some political rivals without trial for decades and brought defamation lawsuits against journalists and opposition politicians. The forum took place just as Russia is gearing up for major celebration on May 9, marking the 70th anniversary of the victory over Nazi Germany in World War II. Not surprisingly, in light of Russia’s continued aggression, Western leaders refused to attend the Victory Day celebration in Russia. German Chancellor Angela Merkel, U.S. President Barack Obama and British Prime Minister David Cameron declined the invitation. The only EU heads of state that are expected to attend the festivities are the leaders of Slovakia and the Czech Republic. As the rift between Russia and the West continues to grow, Putin seems to have entered into a Faustian Pact with fringe political movements, without any regard for future cost or consequences. During Soviet times, the USSR sought to infiltrate and influence left-wing groups and parties in the West. Since Western governments are now facing increasing pressure from far-right movements, the pendulum of Russia’s influence swung all the way to the right. The fact that Russia is no longer attempting to maintain the veneer of civility is an indicator of a very dangerous period in the history of the world that is unfolding before our very eyes. “Caesar Putin” is only getting started.